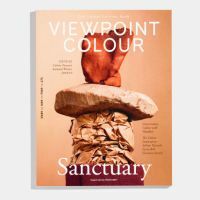 Pantone Viewpoint Colour Issue 02, Sanctuary. Inspirational and informative, Pantone Viewpoint Colour is a seasonal trend book devoted to colour across design. Each issue includes visual imagery, material/finish direction, and trend forecasts displayed in Pantone Colours, along with the latest colour news, emerging colour stories and colour psychology research. The second issue, Sanctuary, explores how our desire to slow down and reflect in this age of uncertainty is influencing the shifting landscape of colour and design. Pantone Viewpoint’s lifestyle approach provides a global perspective across all design, making it relevant to today’s culture and critical to today’s colour decision makers.